Point of Sale is the place where payment changes hands between customer and business in exchange for products or services. LightSpeed POS is a fully integrated, inventory-centric retail system that moves seamlessly from the brick and mortar sales counter, to online, to wherever customers are found. It is multi-user, multi-store and extensible through a developer API so that software never limits the retailer’s imagination. On the other hand, the open-source Magento e-commerce platform is undoubtedly one of the most powerful and versatile ecommerce solutions available. To create the perfect combination for online stores, i95Dev has designed a seamless integration for the LightSpeed POS with existing Magento stores. The two-way integration we provide offers a variety of benefits that allow the stores to work efficiently, both online and offline. Inventory, transaction synchronization and order processing become more streamlined with the real-time integration we provide. 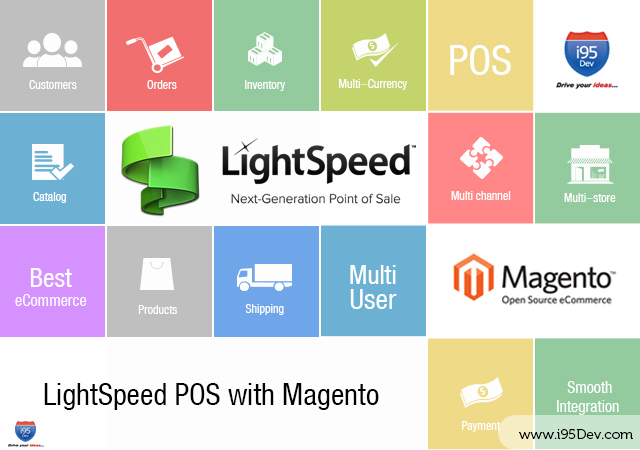 LightSpeed POS integration with Magento simplifies transactions with customers and streamlines business processes. A smooth integration allows online retailers to manage two different platforms concurrently without repetitive data entry. It enables retailers to upload all necessary data to the Magento store, which aids in selling products online, while remaining integrated with the physical store. This prevents stock outs by ensuring inventory is accurate both online and in-store and facilitates the customers by removing the cumbersome processes and allows for real time decision making. Customer information management plays a crucial role in operating a retail business. Detailed customer information such as customer purchase history is synced between LightSpeed POS and Magento and helps in predicting the buying patterns of the customers. This bidirectional information sync not only ensures consistent data across systems but also enables the accessibility of all updated information leading to improved customer service. Order information also is synced between LightSpeed POS and Magento and vice versa. The information synced between the two systems includes products ordered, payment information, etc. This information helps in managing the customers and inventory efficiently. Having accurate inventory information across the channels is of utmost importance. Integrating LightSpeed POS system with Magento automates all inventory information including price, cost and weight in both systems. This ensures that robust and accurate information is available all the time and increases customer satisfaction. This connection automates the synchronization of products between the LightSpeed POS and Magento systems. Information such as product name and description, product SKU, prices and photos are entered once and synced between systems, which saves time and money. Payment is automated and includes payment options such as PayPal, credit cards, checks, Authorize.net, PO orders, credit limits and cash on delivery. Integrating the LightSpeed POS system with Magento allows retailers to integrate data from more than one store, making it possible to update all inventories, sales and pricing information simultaneously and accurately. This solution allows publishing the inventory on various channel sources like Amazon, Facebook and eBay. This ensures increased online visibility of the retailer’s business and drives sales. LightSpeed POS Magento connect gives retailers the ability to not only accept payment in other forms of foreign currency but also display the prices in each specific currency. Shipping is automatically configured with shipping rules that dictate charges and includes real-time integration with all the major carriers. Detailed reports are generated by receiving information from selected stores or all stores. Informed decisions on promotions and particular SKUs can be implemented based on what is and is not selling. With ever-increasing online sales, retailers must maintain consistent information across all channels. An efficient LightSpeed POS and Magento connector will maintain consistency, prevent inventory errors, provide accurate analytics for management decision-making and increase customer satisfaction. To learn more, please feel free to connect with us at info@i95dev.com, http://www.i95dev.com/contact/or give us a call at 301.760.7499.